Bill Nye is contributing to the blog this week as Emily gets back up to speed. Nye spent several years working as an engineer until he combined his dual love of science and comedy to create his on-screen persona, "The Science Guy." Nye's mission for many years has been to turn on the public in general, and kids in particular, to the "way cool" wonders of science. 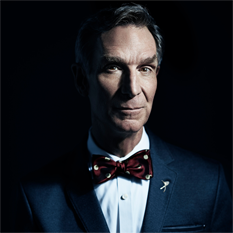 From 1992 to 1998, Nye was the writer, producer and talent for the Emmy award-winning Bill Nye the Science Guy TV series. His latest TV program was Stuff Happens. As your vice president, I do my best to listen to what most of us want in space. Like any other big change, the retirement or grounding of the Space Shuttles will produce opportunities. We've got two big ones: we can make serious plans to have humans visit relatively nearby balanced-gravity Lagrange points on our way to asteroids, and we can start the long diplomatic process that will be required to get taikonauts, astronauts from the China Space Agency, onto the International Space Station (ISS).